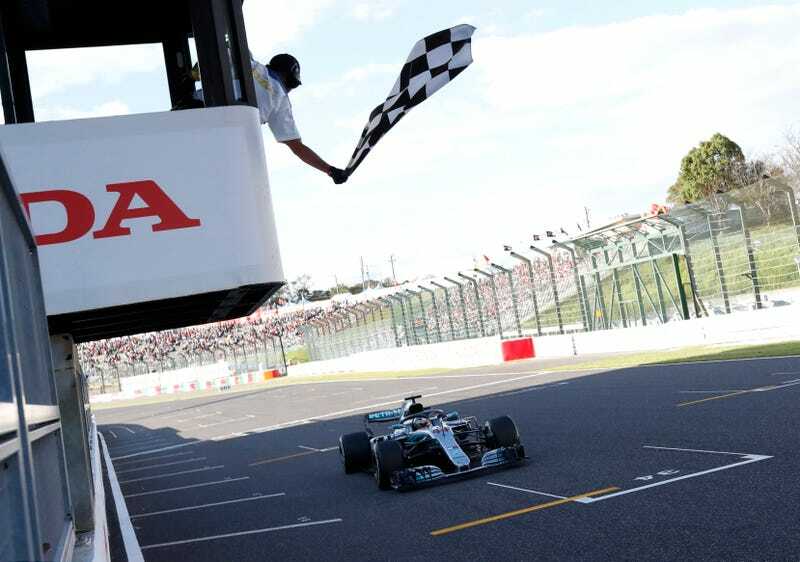 After picking up the pole position in this weekend’s Japanese Grand Prix at Suzuka, with Mercedes teammate Valtteri Bottas playing the ever reliable wing man on the outside of the front row, Lewis Hamilton got away at the start with the ease of a seasoned veteran. With ease, he quickly stretched out a length or two at the front. Hamilton’s only championship rival, Sebastian Vettel, had started down in eighth position, but launched up the field to fourth, thanks in part to Max Verstappen colliding with Kimi Raikkonen at the end of lap one. Kevin Magnussen was rear ended on the start by Charles Leclerc’s Sauber, puncturing his tire. When the tire later shredded and splintered a bunch of carbon on track, the safety car was pulled out to clear it. When the safety car period ended on lap eight, Vettel tried to throw a slider down the inside of Verstappen at Spoon curve, but was carrying far too much speed to make it stick. Vettel made contact with the Red Bull, spinning off into the kitty litter. Verstappen, again, got lucky and continued on without losing a position to Raikkonen in the other Ferrari. Vettel, meanwhile, was kicked to the back of the pack. Despite the off, Vettel had the legs on the rest of the field to return to the back of the front runners. Sebastian fought through traffic to come home with a sixth position finish. Ferrari, to their credit, did not decide to slow Kimi to swap Vettel into fifth for an additional two points. Verstappen kept his third position, despite a 5-second penalty for that early contact with Raikkonen, followed home by Red Bull teammate Daniel Ricciardo, who fought his way to fourth after starting 15th. Predictably, Hamilton saw no real fight for his lead, retaining the front position from flag to flag with Bottas making it a Mercedes 1-2. With just four races remaining, Hamilton could clinch the championship during the US Grand Prix at Circuit of the Americas in two weeks. He needs only score 8 points more than Vettel to lock it down. COTA is a track that favors Hamilton, as he’s won there five of the last six seasons. Should Lewis win his fifth championship later this month, that will put him on level standing with Juan Manuel Fangio, both only behind Michael Schumacher on total championship season victories.